Early last month, I had a post on gold when the bullion recorded its biggest one-day increase ever in price. If you follow this blog long enough, then you know I have talked a lot about good. My investment in gold is not the metal itself, though I bought a couple of pieces of hardware. I invest in gold through a mutual fund, Tocqueville Gold Fund (TGLDX), which mainly invests in precious metal miners (a better choice to invest in gold without physically owning the metal is via gold ETFs such as SPDR Gold Shares (GLD)). When I first bought TGLDX, it was in 2002 when gold was somewhere around $300 an ounce. I never imagined gold could go over $1,000 back then (otherwise, I could have bought a few more gold coins ). The reason for me to have gold in my investments was, well, I need some exposure to the precious metal sector as a diversification. I never bought gold because I want to hedge against inflation and I didn’t buy gold coins because I want to have them as an investment (I could have better returns if the money was invested in stocks). But there are many traders do use gold as a hedge, against inflation, falling U.S. dollar, geopolitical tensions, etc. And there are always demands for gold jewellery from countries like China and India. gold is in a bubble. there is no underlying fundamental that justifies the high price. just like in the early 80s, gold with precipitously drop like two tons of cement, and hopefully Guido didn’t cement your feet in when it does. we are no longer on the gold standard, yet people have this antiquated notion that gold is a hedge against inflation. well since the last bubble and precipitous drop, gold remained flat and declined, so how good is that hedge? that’s right, terrible. moreover, gold is traded like stocks now, unless you actually buy gold bullion, which most people these days do not. since you don’t own the hard gold asset, it isn’t worth anything because you can’t trade it if the world goes belly up. the premise behind gold being inflationary precaution is because the antiquated notion that you can trade gold as currency. well, with investment shares, you don’t have the physical commodity. so tell me how you own gold? that’s right, you don’t. even if you did physically own gold, it isn’t worth the bullion or share price, it is worth scrap price which is far less than market price. again, unless gold by weight is being valuated to exchange for goods and services, it isn’t worth the share trade price or even the true bullion price. people were very happy when gold was dramatically rising past $1k/oz, i’m sure those people were sad when it precipitously fell towards $700/oz. again, diversification and look at the fundamentals. you can ride the wave now, but gold will go back down to $300-$500 eventually and there won’t be any warning when it does in the current euphoria over gold. again mitigate your risk on gold as well. What do you think of gold? Is it a good choice to hedge against inflation? If not, what can be the choice? Jake commented to my original comment about M3 and gold be traded in dollars and gold being finite versus dollars being unlimited; and then end of world people who buy gold for that reason. Supply & demand does not justify the higher gold. There was no sudden decrease in supply and most of the gold trading is done on paper. So yes, there was a high demand to evaluate a real commodity but it is on paper. That is a bubble. Once people leave, the price will plunge back to actual commodity level. for those who are hoarding real gold, the premise is unsound, because the doomsday scenario places a high value on precious metals when there is no reason that people would use gold as a means of currency. plus, you would then have a revaluation of gold to that of services and goods, which is not going to be anywhere near the value which is placed on it now. if you want a different paper hedge, then buy TIPs. 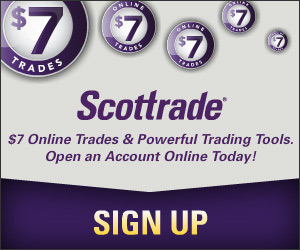 Does anybody know if I can buy good through a broker, such as Scottrade or Zecco? Thanks.